It was only a matter of time before awesome organizers for Keurig and the like starting popping up. Aroma is an all-in-one organizer that stores coffee pods and coffee accessories like stirrers, spoons, sugar, and creamers. The sleek bamboo pieces can be stacked in whatever configuration fits your space. 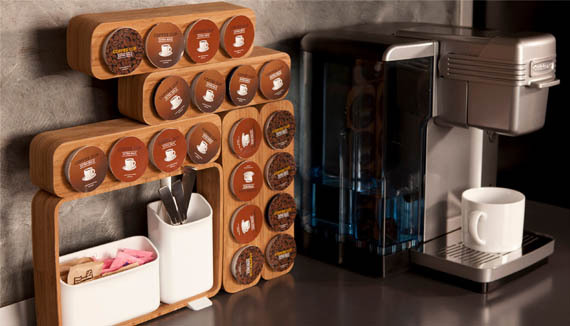 It includes 5 bamboo coffee pod holders (each holds 4 pods, for a total capacity of 20 pods), ceramic containers for accessories and everything you need to create your own coffee station. Perfect for home and ideal for the office, its cool and modern style is sure to perk you up, even before you get a dose of caffeine.